Houston's METRO is preparing to roll out their new bus network on August 16th, which comes as a result of the agency's System Reimagining. But, as with any major change in a city, some residents are still not satisfied. Residents in the Woodland Heights neighborhood of Houston have initiated a petition to modify the proposed 30 bus route. Currently, the neighborhood is serviced by the 40 Pecore route. When METRO's System Reimagining was proposed in early 2015, the 30 Clinton / Ella route was shown to continue on much of the route that is both the current 40 Pecore and 50 Heights routes. Unfortunately, the routes have since changed, leaving Woodlands Heights Residents without transit on Watson / Taylor / Sawyer streets. The originally drawn proposed 30 route was shifted to the east to Houston Avenue. This creates a duplicated north / south service with the proposed 44 Acres Homes route, which incidentally has the same, and if not better, level of service. 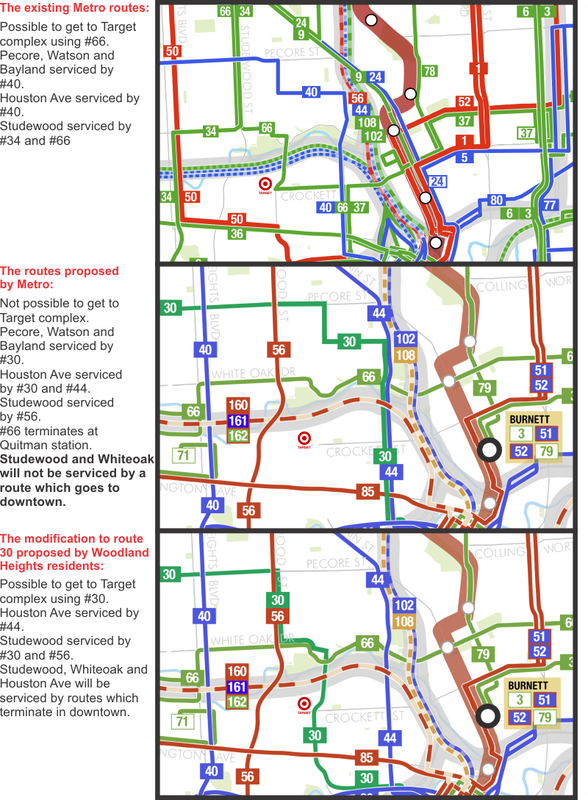 The proposed amendments (from the residents of Woodland Heights) to the route shown below make sense to provide a greater coverage area to residents and major centers of activity, while minimizing duplicated service. METRO will continue to host public hearings regarding the new bus network, with a meeting on Wednesday June 3, 2015 at 6:00 PM, and another on Friday June 5, 2015 at 12:00 PM. Both meetings are scheduled to take place in METRO's Board Room. View the METRO board meetings and notices page for more details. Christopher: Thank you for covering this on your blog. Stan, thanks for the note. I have seen those other petitions as well. It's a tough thing to want to try to limit the traffic in your neighborhood, while still wanting to have access to transit. The petition that I included at least considers access to the shopping center and apartments that are currently being built. I hope that residents can make it to one of METRO's public meetings this week to voice their concerns. How did you find out about proposed changes to the re-imagining routes? When will the CoH figure out they are suppressing transit ridership with minimum parking requirements? It's true that the WHCA hasn't taken an official position, but then again, taking "official positions" is not in their remit. However, the majority of the board members of the WHCA along with the President has signed the petition to reroute the #30, and is sanctioned by the WHCA's VP of Infrastructure. Have to agree about target, there is no way to walk to it besides the heights bike path, every other route is not really made for walking, how would you even get to/from the bus routes there.